Steuart W. Weller - the One Loudoun Elementary School - seeks to cement our school as one of the best in Loudoun! An Updated Innovation Lab/Maker Space. A re-imagined location where students use technology together to solve problems, code and create. New Outdoor Classrooms. Providing students more outdoor learning opportunities amongst nature is an important counter-balance to the increasing use of technology. Subsidized Yearbooks. We believe every student should have a yearbook and this year we will attempt to heavily subsidize the cost so every student has a treasured keepsake. ​None of these enhancements will be possible without the generous support of our local community. 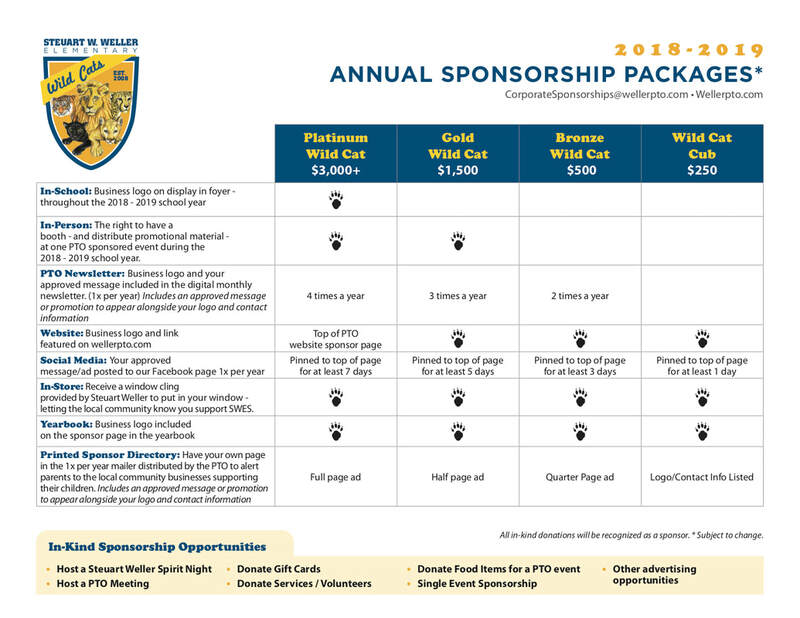 This year, we have developed a sponsorship package that not only allows you to help make the aforementioned improvements a reality but also benefit yourself. We believe that by promoting those that support Weller, the 500+ Weller families will support our local community. Attached to this letter is a list of the sponsorship opportunities available for the 2018 - 2019 school year. If you are interested in a sponsorship or want to ask about other ways you can contribute to Steuart Weller please reach out to our community liaisons, Heidi and Karyn. Interested in learning more? E-Mail Us!